This is the page that covers actions in support of Saberi like protests and visits to speak with Embassy staff. — MFI hosted a protest for the Washington DC community at the Japanese Embassy on Sunday March 21 at 1 pm. — We promised Japan we wouldn’t leave their doorstep til Saberi was free, and we’re keeping that promise. We will host another protest at the Japanese Embassy on Sunday, March 28 at 3pm. We are going with the sakura theme for this event to tie into the Cherry Blossom Festival that brings Japan so much pride each year. This year, Japan’s pride should be tempered indeed. (blog announcement / facebook announcement). — And on Wednesday, March 31st, the Free Jamal! 2010 Campaign has issued a call for a Global Day of Action against Japanese anti-refugee policies to coincide with the end of UN Special Rapporteur Jorge Bustamante’s mission to observe the human rights situation of migrants in the country and his scheduled press conference on that day in Tokyo. We will post our materials, chants, slogans, letters, press releases, and event reports here for anyone to use to conduct their own protest in support of Jamal Saberi, and all refugees around the world – this action by Japan threatens all refugees regardless of national origin. Our activities leading up to, during, and after the demonstration in front of the Japanese Embassy should communicate these objectives, specifically through the texts we produce (letters to orgs, press release), the chants that we shout, the slogans on our signs, and the music played at the event. Below is a list of tasks for the March 21 event. – FREE JAMAL 2010 Campaign This site is very user-friendly and provides background information, contact addresses, sample letters, and also gives updates on actions, protests, and generally how the campaign is progressing in terms of attaining the Campaign’s objectives. – Hambastegi provides a good summary background of Saberi’s situation and also provides and automated email service so you can easily send your message of protest to Japan. 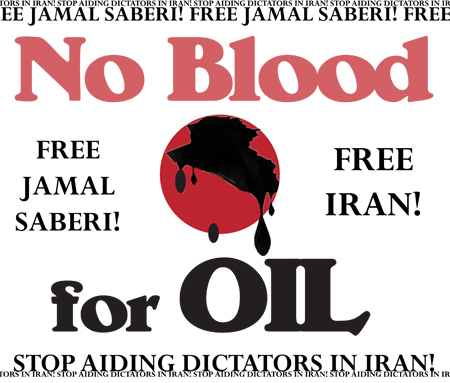 – The Free Jamal Campaign ( in English / in Japanese ) Here is a Japanese site that contains a good amount of background information on Saberi’s situation. Importantly, it also has some documentation of what has happened to Iranian political activists who have been deported from the countries in which they have sought asylum and sent back to Iran.